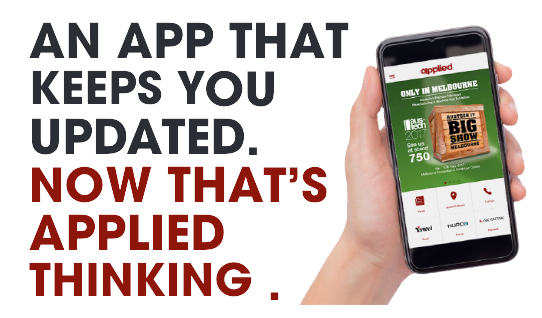 Please install the APPLIED app to keep up to date with the latest in industry news, machinery launches and promotions from one of Australia’s premier suppliers of equipment to the sheetmetal, engineering, recycling and plastics industries. The launch version of our app is skinned for AUSTECH 2017, Australia’s premier exhibition for machine tool technology. Though after AUSTECH, we’ll be updating the app to bring you a wider range of products and tools to give you the information that you need, whenever you need it – 24/7. Version 1.0 is just the start, as our app evolves it will become a hub for all of your machinery sales, service and support requirements. With over 25 years’ experience in the industry, Applied Machinery has the expertise to get you the best equipment for your job – on time and on budget. To give us feedback, or if you are in need of assistance with our app, please call 03 9706 8066.